What is Mast Cell Activation? Mast Cell Activation Syndrome (MCAS) and Mast Cell Activation Disorder (what my docs call my disease) are within a spectrum of mast cell activation conditions. I have this condition – it is not fun. My diagnosis was verified through the three co-criteria requirement explained here. I had to leave my state and go to Boston to get the diagnosis. Not all patients are as fortunate as I am to have had access to these tests and doctors…. What the heck is Mast Cell Activation anyway? What does this have to do with EDS and pain? Many EDS patients have intra-cellular motility/extracellular matrix issues and cellular membrane instability issues as a direct result of their collagen defect. Yes, one small little defect in DNA regarding the use of collagen can effect something as little as HOW WELL THE CELL WALL OF A MAST CELL REMAINS TOGETHER. Ultimately determining if your body gets flooded with vaso- constrictors (makes your veins get small! ), histamine, prostaglandins and a bunch more systems-altering chemicals at seemingly little to no provocation. What this means, basically, is the mast cell patient’s immune system is “on the fritz” and incorrectly identifies things in the environment as “bad” and treats them as such. This results in allergic-type reactions as well as autoimmune reactions to things like SUNLIGHT, changes in temperature, etc. It’s like having moderate and chronic anaphylaxis symptoms at all times. It’s a tricky condition to manage. For some EDS patients, like me, mast cell activation disorder triggers full body inflammation – popping out joints with the swelling, guts all inflamed, sinus problems, skin manifestations/rashes/hives, muscles inflamed and burning/weak (feel like they are filled with lactic acid), brain fog, bone pain, headaches, migraines… and then my autoimmune system starts attacking parts of my body (because I also have ulcerative colitis). Since I also have postural orthostatic tachycardia syndrome (meaning my blood pressure drops to 80/50 and my heart rate doubles when standing for a few minutes) – the combination of a mast cell flare, EDS flare, and UC flare means I cannot stand up without passing out when all hell breaks loose in my body! THIS IS A CONDITION WHICH MANY PEOPLE DO NOT UNDERSTAND OR KNOW ABOUT AND THEY ARE SUFFERING AS A RESULT! Mast Cells (MCs) were first discovered in the late 19th century by German physician and scientist Paul Erlich. He saw a new type of cell from around blood vessels and connective tissue that appeared to have large granules inside. Erlich incorrectly believed that these cells fed others, so called them “Mastzellen” (German for “fattening cells”). Mast cells are actually part of the immune system, protecting the body from parasites and other things that shouldn’t be there. MCs first develop from blood stem cells in the bone marrow, then change further depending on where in the body they end up. Unlike other immune cells it is normal for mature (fully changed) MCs to stay around the tissue they moved to (such as nerves and blood vessels). Mast cells work by being “activated” by things the body interprets as potentially harmful, the mast cells then release histamine and other molecules into the surrounding tissue to signal a response from the body, which leads to swelling, warmth, and redness (inflammation). MCs are best known for their role in allergic responses like asthma, food allergy, and anaphylaxis, but recent research suggests they may have a role in many non-allergic disorders. Cells of the body are surrounded and supported by a network called the Extracellular Matrix (ECM), which can be made from structural materials like collagen. Structural materials like collagen play an important role in the connective tissue of the body generally, and are associated with the Ehlers-Danlos syndromes (EDS). MCs can stick to the ECM, which in turn alters their behavior. EDS, as a connective tissue disorder, could change the ECM enough to cause a change in MC behavior. SOO, that’s the basics of mast cells and why this seems to happen a lot with folks with EDS. NOWWWWW, let’s get to learn a little about these mast cells, eh? Mast cells (MC) are immune system cells that live in the bone marrow and in body tissues, internal and external, such as the gastrointestinal tract, the lining of the airway, and the skin. Everyone has mast cells in their body, and they play many complex and critical roles in keeping us healthy. The positive roles that they play include protecting us from infection, and helping our body by participating in the inflammatory process. However, mast cells are also involved in allergic reactions, from the tiny swelling that appears after a mosquito bite to a life threatening, full-blown anaphylaxis. 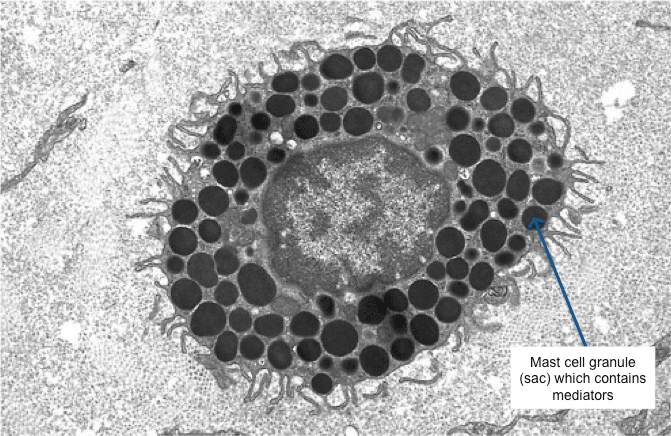 Mast cells have within them small sacs, or granules, surrounded by membranes. The sacs contain many different kinds of substances called mediators, which participate in all of the roles above, including allergic response and anaphylaxis. There is a difference between someone who is healthy, with mast cells that are functioning normally, and someone with a mast cell disorder, whose mast cells may be activating inappropriately in response to triggers, or may also be proliferating and accumulating in organ tissues. What kinds of things are INSIDE of mast cells? WHAT CAN THEY DO TO A PERSON? The myriad symptoms patients with mast cell disorders experience during mast cell activation can wreak havoc on patients on a daily basis, and multiple organ systems, including pulmonary, cardiovascular, dermatologic, gastrointestinal, musculoskeletal, and neurologic can be involved. Table 1 lists some potential effects linked to specific mediators.5-13 Symptoms (Table 2) may include, but are not limited to: flushing of the face, neck, and chest; headache; tachycardia and chest pain; abdominal pain, bloating, gastroesophageal reflux disease (GERD), diarrhea, vomiting; uterine cramps or bleeding; rashes, including maculopapular cutaneous mastocytosis (MPCM)/urticaria pigmentosa (UP), telangiectatic lesions; bone/muscle pain, osteosclerosis, osteopenia, osteoporosis; itching, +/- rash; blood pressure instability; brain fog, cognitive dysfunction; anxiety/depression; lightheadedness, syncope; and anaphylaxis. These symptoms may appear as acute (as in anaphylaxis, see Table 3) or as chronic conditions. It should be noted that the manifestation of anaphylaxis or similar symptoms among infants and preschoolers may be more difficult to identify. This list is by no means complete and serves as an example. Mast cells secrete many mediators responsible for numerous symptoms within different organ systems. Finally – WHAT THINGS TRIGGER MAST CELL ACTIVATION? What does a person with MCAD/MCAS have to look out for in the world around them? Basically, your body becomes “allergic” to life. There are things to help, however! Anti-histamines that work at the different histamine receptors in the body, for example (link to medications for mast cell). Controlling symptoms of mast cell activation/mediator release starts with avoiding the very triggers which we know will initiate mast cell activation in us, and the triggers can be very individual. Avoiding heat, cold, abrupt changes in temperature, sunlight, strong odors/perfumes and chemical smells can help many patients. Caution must be taken around venomous creatures such as bees, wasps, hornets, spiders, jellyfish and snakes, etc. Stress and fatigue can be major triggers for many patients, as can viruses, bacterial and fungal infections. Sometimes a simple change in routine can trigger us! Many foods can trigger mast cells to activate and release their mediators; shellfish, peanuts, nuts, citrus, and high histamine foods are high on the list of potential triggers known to bother some people, but not others. Medications to be taken with caution include NSAIDs such as ibuprofen, toradol, aspirin (this can be confusing, because aspirin can also be used as a treatment for those with high prostaglandin levels; when used as a treatment it must be started under the supervision of a physician! ), opioid narcotics, alcohol, the intravenous form of vancomycin (the oral form is usually fine), some anesthetics, some antibiotics, and topical agents, like benzocaine. However, everyone is different, and anyone can react to anything, and you can even react to something that you have never reacted to before, so always proceed with caution. Always have someone with you when taking a new medication, starting a new treatment, or traveling to a new place. The most irritating thing can be that sometimes we do not even know what the trigger was that sent us into a mast cell frenzy! In that case, treat the symptoms, get some rest, and then review the last few days to see if you can spot a culprit. Also, remember that your response may be delayed. You may have an alcoholic drink on Saturday, and then be symptomatic several days later. Keeping a food, medicine and symptom diary can help you connect the dots! A HUGE THING FOR PEOPLE TO RECOGNIZE IS THE ROLE OF ALCOHOL IN THEIR DIETS AND ITS IMPACT ON THEIR BODIES/MIND.